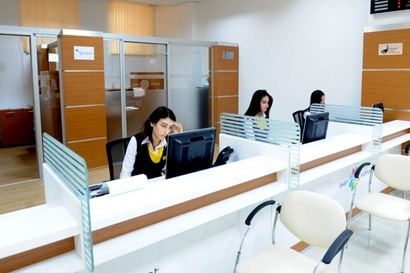 A service center in Baku established with the Azerbaijani government's support started rendering services on Tuesday. The ASAN Service center No. 1 was created under the State Agency for Public Services and Social Innovations under the Azerbaijani President to ensure unified and coordinated provision of services by state bodies. Head of the agency Inam Karimov told media on Monday, "Within the pilot project ASAN Service center will provide services only to residents of Nasimi and Narimanov districts of the capital. By early June the ASAN Service centers will cover the entire territory of Baku." Online services, as well as phone services, will be available from February 1. According to Karimov, ASAN Service centers will start working in Ganja and Sumgayit, Azerbaijan's second and third-largest cities, in June. The centers will gradually expand services to cover the whole country. People residing in Azerbaijani regions as well as residents of the capital may appeal to the centers. Once the ASAN Service launches its full operation, Azerbaijani citizens will be able to appeal to any ASAN Service center, regardless of the area of their registration, Karimov said. Karimov added that the whole network will be available in about two years. Opening of three or four ASAN Service centers is planned in Baku. The centers' work will be based on the principles of transparency, convenience and efficiency, as well as creation of appropriate conditions for compliance with these principles, Karimov said. According to him, construction of new buildings for ASAN Service centers will be launched this year as part of a state investment program. The buildings meeting all the necessary requirements will be commissioned next year. ASAN Service centers can also be used by foreign nationals to obtain a temporary residence permit and migrant status in Azerbaijan, Karimov noted. The ASAN service center's website was launched on January 7. The website has such sections as "ASAN services", "Online queue", "Call center", "Online contact", "Useful information", "Self-service," "Offsite service", "E-ASAN" and "Contact us". The State Agency for Public Services and Social Innovations and ASAN Service Center No.1 were opened by Azerbaijani President Ilham Aliyev on December 29. The agency and the service were created by the presidential decrees issued on July 13 and September 5. The state agency was established to increase transparency in state bodies' activity, render more high quality, convenient services to citizens by using new methods and innovations, improve services and accelerate the transition to electronic services. The agency is to manage specially created ASAN-Xidmet (service) centers, coordinate the work of employees of government agencies, who will work in the centers, deal with integration of databases of state agencies, swiftly organize e-services, and improve the governance system. At the first stage, three centers will be set up in Baku, where citizens will have access to 24 services of nine state agencies -- the Ministries of Justice, Internal Affairs and Taxes, the State Committee on Property Issues, State Customs Committee, State Migration Committee, State Land and Cartography Committee, State Social Protection Fund and National Archive Department. Special terminals will be installed at ASAN-Xidmet centers in January 2013. The services will be available for a special duty, but handicapped people and children with disabilities will benefit from them free of charge. This will include such services as registration of marriages, births, death certificates, issuance of ID cards by the Interior Ministry, driver's license replacement, obtaining passports, etc. The services to be available over the Internet will be rendered through the "single window" (one-stop shop) principle. The Baku center is located at Heydar Aliyev St. 36 and is open from 10:00 AM until 20:00 PM and until 17:00 PM on Sundays.